For other albums, see Babel#Albums. Babel is the second studio album by British rock band Mumford & Sons. As with Sigh No More, the album was produced by Markus Dravs. The vinyl LP version of the record was pressed by United Record Pressing in Nashville, Tennessee. It was released on 21 September 2012 in Ireland, Germany, Belgium, the Netherlands, Luxembourg, Norway, Australia and New Zealand. It was released on 24 September 2012 in the United Kingdom, Scandinavia, Spain, Italy, Eastern Europe, South America, and on 25 September 2012 in the United States and Canada. Upon its release, Babel debuted at number one on both the UK Albums Chart and the US Billboard 200. It became the fastest-selling album of 2012 in the UK, selling over 159,000 copies in its first week, and was the biggest selling debut of any album in 2012 in the US at the time, selling 600,000 in its first week. The album received generally positive reviews from music critics and was nominated in the category of Album of the Year for both a Brit Award and Grammy Award, winning the latter. In late 2010, Mumford & Sons had already begun road-testing new material that they had been working on. Most of these songs, including "Broken Crown" and "Below My Feet", had already been played live on numerous occasions before the album's release. Mumford & Sons decided not to change their sound on Babel, which is the follow-up to 2009's highly successful Sigh No More, which elevated them to international fame. They did, however, admit that they purposely took their time in order to perfect the sound that they had already developed. After a year of speculation, it was finally announced via their official website on Monday, 16 July 2012 that their new album Babel would be released in the UK on 24 September, and the following day in the US. A final track list and album art were also revealed, as well as a 30-second promo. Babel was made available for preorder on the band's official website on Monday, 23 July, when it was announced that the album would also be released as a vinyl LP and a deluxe edition with additional tracks. The album's official lead single is "I Will Wait". The band premiered the song on Zane Lowe's BBC Radio 1 show on 7 August 2012. On 29 August 2012, Mumford & Sons recorded their live performance of "I Will Wait" at Red Rocks Amphitheatre in Colorado. The performance was released on 9 September as the band's official video for the song. The album's second single is "Lover of the Light". The music video was released on 7 November and stars actor Idris Elba who also directed the short film. The song was officially released on 3 December 2012. The third single from the album is "Whispers in the Dark". The music video premiered on 11 March 2013. The title-track "Babel" is their fourth single off the album. It has already made it into the BBC Radio 1 Playlist's A list. A music video for the song "Hopeless Wanderer" premiered on 4 August 2013. It featured Jason Sudeikis, Jason Bateman, Ed Helms and Will Forte as Marcus Mumford, Winston Marshall, Ben Lovett and Ted Dwayne, respectively. The video was released on both Vevo and YouTube; within less than four days on the latter site, the video already had over 3 million views. Babel received generally positive reviews from music critics. At Metacritic, which assigns a normalized rating out of 100 to reviews from mainstream critics, the album received an average score of 63, based on 33 reviews. Mojo magazine found it to be "more than just a decent nu-folk album," but also "a great pop album", while the Daily Mail said that Mumford & Sons add "a fresh sheen to rustic folkrock" on Babel. Clash called it a "rip-roaring record" with catchy hooks and "not much depth," but "some good tunes". Davis Inman of The A.V. Club found the entire album "sonically impeccable", even though Mumford's imagery seems "like go-to words in a lazy songwriter's starved lexicon." Q called it an "ultimately comfortable listening, befitting folk sounds of a resolutely un-freak variety." Melissa Maerz of Entertainment Weekly viewed that the music will convince listeners who cannot appreciate "lyrics this earnest", as the band "has mastered the emotional gut-punch of quiet/loud dynamics". Kelly O'Brien of State praised the band's "unrestrained ardour and zealous poetry", and wrote that they "manage to play loudly and boisterously, without ever making the descent into cacophony." Will Hermes of Rolling Stone cited the band's lyrics as the album's defining characteristic, writing that they use "church flavor" to "supersize and complicate love songs." Magnet magazine found Babel to be a "more subtle and accomplished album" than Sigh No More. In a mixed review, Kevin Perry of NME called it an "average", "middle of the road" album and "a retooled, streamlined adaptation" of Sigh No More. Greg Kot of the Chicago Tribune found its songwriting "pedestrian" and felt that the "loud-quiet-loud dynamic" of both the singing and the music "becomes repetitive." Allmusic's James Christopher Monger felt that its "incredibly spirited" songs "bark much louder than they bite" and found most of the album "delivering its everyman message with the kind of calculated spiritual fervor that comes from having to adapt to the festival masses as opposed to the smaller club crowds." Chuck Eddy of Spin panned the band's "U2-style evangelism" and wrote that they "don't seem remotely musically curious." Andy Gill of The Independent headlined his review "A Heart-to-Heart with the Nu-Folk Romantics" and accused Mumford of "wallowing self-absorption" while lacking "metaphor and metonymy". Kitty Empire of The Observer called Babel "an anodyne record, lacking the shivery authority of Laura Marling's work", and viewed the band's "lack of nuance" as counterintuitive, writing that "folk is a malleable resource, and here it is stripped of all politics or witness-bearing, becoming an exercise in romantic exegesis for nice men with mandolins." Uncut magazine wrote similarly that the love themes "[reduce] the genre to the level of rusticised boy-band pop." Rolling Stone ranked Babel number 11 in their list of the 50 Best Albums of 2012. The album was nominated for four Grammy Awards, winning Album of the Year at the 55th Annual Grammy Awards. Babel was also nominated for the Brit Award for British Album of the Year at the 2013 BRIT Awards. Babel won the Juno Award for International Album of the Year. It was also included in Q Magazine's list of the 50 Greatest Albums of 2012. Babel debuted at number one in the UK selling 159,000 copies and becoming the fastest selling album of 2012. It also sold 573,000 copies in the UK in 2012. The album debuted at number one on the US Billboard 200, selling 600,000 copies, the second biggest debut of the year behind Taylor Swift's album, Red. The album spent a total of 15 weeks at No. 1 on the Billboard Alternative Albums chart, longer than any other album has since Dark Horse by Nickelback. It sold 1,463,000 copies in the US in 2012, which made it the fourth best-selling album in the US in 2012. It was also the eleventh best-selling album of 2013 with 1,096,000 copies sold for the year. As of May 2015, the album has sold 2.7 million copies in the US. The album also debuted at number one on the Canadian Albums Chart selling 75,000 copies. All tracks written by Ted Dwane, Ben Lovett, Marcus Mumford and Winston Marshall, except for "The Boxer" by Paul Simon. On 29 October 2012 was announced on the band's website a new version of the album titled "Gentlemen of the Road Edition". This is the album alongside the bonus tracks, accompanied by a CD/DVD of the film The Road To Red Rocks, containing interviews and footage with the band, recorded by the duo Fred & Nick whilst on Gentlemen of the Road touring circuit, at the two sold out concerts at the venue. The track listing is similar on both CD and DVD, with the exception of "Thistle & Weeds", contained only in the DVD. Winston Marshall – banjo, electric banjo, electric bass, electric guitar, resonator guitar, backing vocals, lead vocals on "For Those Below" and small part in "Lovers Eyes"
Jerry Douglas – Dobro and backing vocals on "The Boxer"
Paul Simon – electric guitar and backing vocals on "The Boxer"
^ "Mumford & Sons' New Album Announcement". Retrieved 23 July 2012. ^ "Now available for preorder: Mumford & Sons' upcoming album 'Babel'". Retrieved 23 July 2012. ^ "LISTEN: Mumford & Sons unveil new single 'I Will Wait'". Clixie. 9 August 2012. Archived from the original on 19 April 2013. Retrieved 24 September 2012. ^ a b "Mumford & Sons Match Grandeur of Red Rocks on 'I Will Wait". Rolling Stone. Retrieved 3 October 2012. ^ "Mumford and Sons release hilarious Hopeless Wanderer video". Music Blogged. 4 August 2013. Retrieved 6 August 2013. ^ "Reviews for Babel by Mumford & Sons". Metacritic. Retrieved 9 January 2016. ^ a b Monger, James Christopher (24 September 2012). "Babel – Mumford & Sons". AllMusic. Retrieved 6 December 2012. ^ a b Inman, Davis (25 September 2012). "Mumford & Sons: Babel". The A.V. Club. Retrieved 21 December 2012. ^ a b Maerz, Melissa (1 October 2012). "Babel (2012): Mumford & Sons". Entertainment Weekly. Retrieved 6 December 2012. ^ Costa, Maddy (20 September 2012). "Mumford & Sons: Babel – review (Island)". The Guardian. Retrieved 6 December 2012. ^ a b Perry, Kevin EG (21 September 2012). "Mumford & Sons – 'Babel'". NME. London. Retrieved 12 February 2013. ^ a b "Review: Babel". Q. London: 96. October 2012. ^ a b Hermes, Will (20 September 2012). "Babel". Rolling Stone. New York. Retrieved 12 February 2013. ^ Keefe, Jonathan (24 September 2012). "Mumford & Sons: Babel". Slant Magazine. Retrieved 12 September 2013. ^ a b Eddy, Chuck (24 September 2012). "Mumford and Sons, 'Babel' (Gentlemen of the Road/Glassnote)". Spin. New York. Retrieved 12 September 2013. ^ "Babel Reviews, Ratings, Credits, and More". Metacritic. CBS Interactive. Retrieved 12 February 2013. ^ "Review: Babel". Mojo. London: 82. October 2012. More than just a decent nu-folk album, Babel is a great pop album. ^ "New Releases". Daily Mail. 21 September 2012. ^ Hampson, Gemma (19 September 2012). "Mumford And Sons – Babel". Clash. Retrieved 6 December 2012. ^ O'Brien, Kelly (27 September 2012). "Mumford and Sons – Babel". State. County Kildare. Retrieved 12 February 2013. ^ "Babel, Mumford & Sons". Magnet. Philadelphia (92): 56. October 2012. ^ Kot, Greg (27 September 2012). "Album review: Mumford & Sons, 'Babel'". Chicago Tribune. Archived from the original on 12 February 2013. Retrieved 6 December 2012. ^ Empire, Kitty (22 September 2012). "Mumford & Sons: Babel – review". The Observer. London. The New Review section, p. 30. Retrieved 12 February 2013. ^ "Babel-Mumford & Sons". Uncut. London: 84. October 2012. ...the focus on matters of the heart is limiting, reducing the genre to the level of rusticised boy-band pop. ^ "Mumford & Sons, 'Babel'". Rolling Stone. ^ Lewis, Randy (10 February 2013). "Grammy Awards 2013: Mumford & Sons' 'Babel' wins album of the year". Los Angeles Times. Retrieved 12 February 2013. ^ "2013 | International Album of the Year | Mumford & Sons | The JUNO Awards". The JUNO Awards. Retrieved 30 August 2018. ^ "Q Magazine's Top 50 Albums of 2012". ^ Dan Lane (2 January 2013). "The Official Top 40 Biggest Selling Albums of 2012 revealed!". Official Charts Company. Retrieved 5 January 2013. ^ Keith Caulfield (2 October 2012). "Mumford & Sons' 'Babel' Scores Biggest Debut of Year, Bows at No. 1 on Billboard 200 Chart". Billboard. ^ Paul Grein (3 January 2013). "Chart Watch Extra: Top Albums of 2012". Chart Watch. Yahoo Music. Retrieved 5 January 2013. ^ Grein, Paul (18 December 2013). "Chart Watch: Justin Timberlake Paces The Year In Music 2013". Chart Watch. Yahoo! Music. Retrieved 19 December 2013. ^ a b Keith Claufield (7 May 2014). "Mumford & Sons Set for Second No. 1 Album on Billboard 200 Chart". Billboard. (Prometheus Global Media). Retrieved 8 May 2015. ^ john-williams. "Mumford & Sons, Deadmau5, Green Day explode onto charts". The Turn Table. Archived from the original on 3 July 2013. ^ "The Road To Red Rocks – The Film". Retrieved 27 March 2013. ^ "Australian Charts – Mumford & Sons – Babel (album)". Australian-charts.com. Hung Medien. Archived from the original on 7 November 2012. Retrieved 30 September 2012. ^ "2012 Swiss Album Charts". austriancharts.at. Archived from the original on 21 October 2012. Retrieved 14 October 2012. ^ "Charts Vlaanderen – Mumford & Sons – Babel (album)" (in Dutch). Ultratop. Hung Medien. Archived from the original on 31 October 2012. Retrieved 30 September 2012. ^ "Danish Charts – Mumford & Sons – Babel (album)" (in Danish). hitlisten.nu. Retrieved 30 September 2012. ^ "Dutch Charts – Mumford & Sons – Babel (album)" (in Dutch). Dutchcharts.nl. Hung Medien. Archived from the original on 25 December 2012. Retrieved 30 September 2012. ^ "Finnish Charts – Mumford & Sons – Babel (album)". Finnishcharts.com. Hung Medien. Archived from the original on 30 January 2013. Retrieved 30 September 2012. ^ "Irish Music Charts: Week ending 27th September 2012". Archived from the original on 11 May 2012. Retrieved 5 October 2012. ^ "Italiancharts.com – Mumford & Sons – Babel". Hung Medien. ^ "マムフォード＆サンズのCDアルバムランキング、マムフォード＆サンズのプロフィールならオリコン芸能人事典-ORICON STYLE". Oricon.co.jp. Retrieved 3 May 2013. ^ a b "NZ Top 40 Albums Chart – 01 October 2012". Recording Industry Association of New Zealand. Archived from the original on 14 May 2012. Retrieved 1 October 2012. ^ "VG-Lista – Mumford & Sons – Babel (album)". Norwegiancharts.com. Hung Medien. Archived from the original on 17 January 2013. Retrieved 13 January 2013. ^ "South African Top 20 Albums Chart". RSG (Recording Industry of South Africa). Archived from the original on 7 November 2012. ^ "Swedish Charts – Mumford & Sons – Babel (album)". Swedishcharts.com. Hung Medien. Archived from the original on 14 December 2012. Retrieved 30 September 2012. ^ "2012 Swiss Album Charts". Hitparade. Archived from the original on 17 October 2012. Retrieved 14 October 2012. ^ "Archive Chart". UK Albums Chart. The Official Charts Company. Retrieved 6 October 2012. ^ "Mumford & Sons Chart History (Top Americana/Folk Albums)". Billboard. ^ "Mumford & Sons Chart History (Top Rock Albums)". Billboard. ^ "Mumford & Sons Chart History (Top Alternative Albums)". Billboard. ^ "Adele, Gotye Top SoundScan Year-End Charts in Canada". Billboard. ^ "Canadian Albums: 2013 Year-End Charts – Billboard". Billboard. ^ "Lorde topped by Sol3 Mio in album charts". New Zelaand Herald. 25 December 2013. Retrieved 26 December 2013. ^ "Top 50 Albumes Anual 2013". Promuiscae.es. Retrieved 3 February 2014. ^ "Alternative Albums: 2013 Year-End Charts". Billboard. Prometheus Global Media. Retrieved 16 January 2015. ^ "2013 Year End Charts – Top Billboard 200". Billboard. Retrieved 9 December 2014. ^ "2013 Year End Charts – Top Billboard Rock Albums". Billboard. Retrieved 9 December 2014. ^ "2013 Year End Charts – Top Billboard Folk Albums". Billboard. Retrieved 30 December 2014. ^ "2013 Year End Charts – Top Billboard Independent Albums". Billboard. Retrieved 30 December 2014. ^ "Alternative Albums: 2014 Year-End Charts". Billboard. Prometheus Global Media. Retrieved 16 January 2015. ^ "2014 Year End Charts – Top Billboard 200". Billboard. Retrieved 9 December 2014. ^ "2014 Year End Charts – Top Billboard Rock Albums". Billboard. Retrieved 9 December 2014. ^ "2014 Year End Charts – Top Billboard Folk Albums". Billboard. Retrieved 30 December 2014. ^ "2014 Year End Charts – Top Billboard Independent Albums". Billboard. Retrieved 30 December 2014. ^ "Austrian album certifications – Mumford & Sons – Babel" (in German). IFPI Austria. Enter Mumford & Sons in the field Interpret. Enter Babel in the field Titel. Select album in the field Format. Click Suchen. ^ "Ultratop − Goud en Platina – albums 2012". Ultratop. Hung Medien. 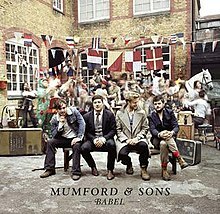 ^ "Canadian album certifications – Mumford & Sons – Babel". Music Canada. ^ "Mumford & Sons "Babel"". IFPI Denmark. 24 October 2017. Retrieved 31 October 2017. ^ "Gold-/Platin-Datenbank (Mumford & Sons; 'Babel')" (in German). Bundesverband Musikindustrie. Retrieved 14 April 2018. ^ "Irish album certifications – Mumford & Sons – Babel". Irish Recorded Music Association. ^ "Italian album certifications – Mumford & Sons – Babel" (in Italian). Federazione Industria Musicale Italiana. Select "2016" in the "Anno" drop-down menu. Select "Babel" in the "Filtra" field. Select "Album e Compilation" under "Sezione". ^ "Dutch album certifications – Mumford & Sons – Babel" (in Dutch). Nederlandse Vereniging van Producenten en Importeurs van beeld- en geluidsdragers. Enter Babel in the "Artiest of titel" box. ^ "Norwegian album certifications – Mumford & Sons – Babel" (in Norwegian). IFPI Norway. Retrieved 20 November 2018. ^ "Guld- och Platinacertifikat" (in Swedish). IFPI Sweden. Retrieved 20 November 2018. Type Mumford & Sons in the top right search bar. Click on "Sok" and select "Visa" under Babel to see certification. ^ "The Official Swiss Charts and Music Community: Awards (Mumford & Sons; 'Babel')". IFPI Switzerland. Hung Medien. Retrieved 20 November 2018. ^ Jones, Alan (11 May 2015). "Official Charts Analysis: Mumford & Sons score second No.1 with sales of 81,351". Music Week. Retrieved 23 May 2015. ^ "British album certifications – Mumford & Sons – Babel". British Phonographic Industry. Select albums in the Format field. Select Platinum in the Certification field. Type Babel in the "Search BPI Awards" field and then press Enter. ^ "American album certifications – Mumford & Sons – Babel". Recording Industry Association of America. If necessary, click Advanced, then click Format, then select Album, then click SEARCH. ^ "IFPI Platinum Europe Awards – 2013". International Federation of the Phonographic Industry. Retrieved 2 August 2013. This page was last edited on 14 March 2019, at 18:22 (UTC).